Mary Costantino, also a little Italian lady and author of the camel ride posting, tried her hand at translating the cookie recipe I blogged about in early December. I especially anticipate adding the 4 oz of cats called for about 2/3 of the way down the list. I’m wondering if there is any special part required and if the neighbor’s cat will sit still while I extract it. 4 oz of ? cats? something done to them ? mazzo means pack ?of some amount of teaspons of bicarbonit ?baking power or soda? 4 small ?teaspons of ?May? cant really make out the rest. Between the two translations, I now have 90% of the ingredients and all of the instructions. Have a happy, healthy, and productive New Year. 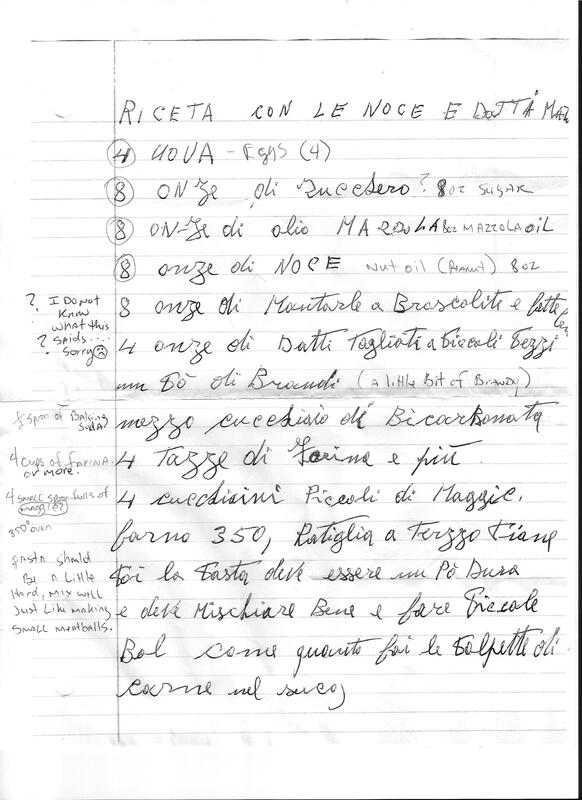 I sent a copy of the recipe to a friend whose parents spent some time living in Italy–and they are great cooks! Think there’s an addition or two to what you have above. The recipe is really hard to translate. For example… Riceta is not an italian word that I know. I also looked it up in my dictionary. So I am missing a syntax or stylization here. It is Risotto? There are many varieties of Risotto al Noce. Noce is a walnut in italian. But Noce can also just be nuts which could include lots of other stuff. So…. Here is what I know. 4 ounces of Zucesero? No idea. 8 ounces of Olio di Masoula? Missed. No idea. If this is Mazola I would substitute Olive oil. 8 ounces of Walnuts. Got that one. 8 ounces of Montarle a Brascoliti a fatte ? Yikes. No known substitute from where I sit. 4 ounces datti tagliati a biscoli teggi. Wow. All I know here is that “tagliati” is “to chop”. I told Steve that we needed to invite Raphaela and Mike to dinner, then I can ask about the recipe and have him translate. (I’m wondering if there is a little French mixed in. They lived in Montreal for years.) However, that simple solution would spoil all the fun I’m having trying to solve the mystery.